One of the most gripping and spooky scenes in C.W. 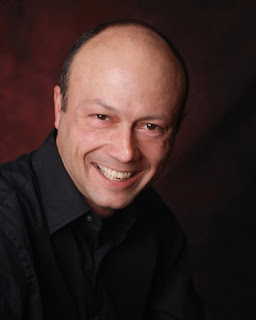 Gortner's novel The Last Queen (read review) was when Queen Juana demands to have her husband's coffin opened, even after he's been dead for many days. Did this really happen? Gortner's research for his novel unveiled many things. Read on as he explains in fascinating detail about one of Spain's most famous but forgotten queen. Grief and Coffins: Was Juana of Castile really mad? 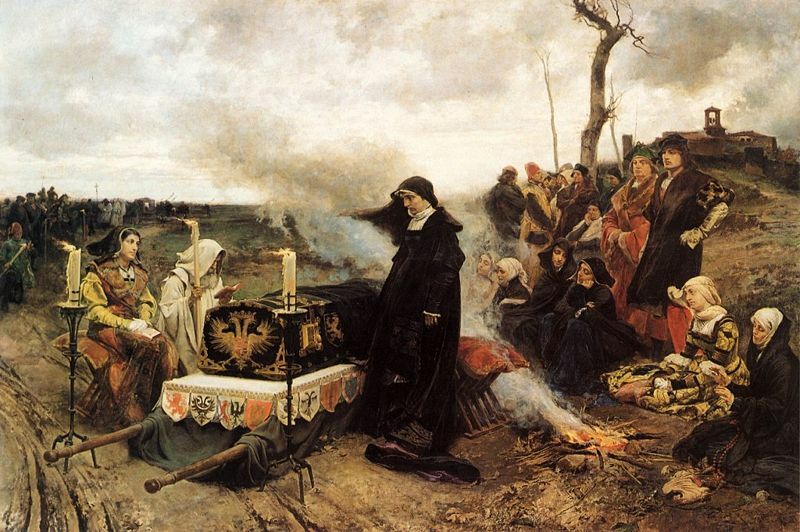 One of the most iconic images of Queen Juana of Castile, known to history as la Loca, or the Mad, is of her standing over a coffin, black veils blowing in the wind as she reaches out a long, trembling hand to open the lid. About her, the courtiers of her retinue look on in silent horror, powerless to stop the demented queen from gazing in disconsolation upon her husband’s shrouded corpse. 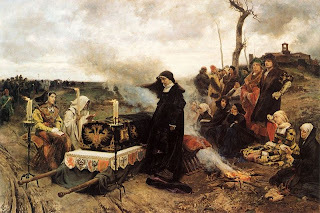 The coffin, brought with her from the northern city of Burgos, has crossed most of Castile with her and will remain by her side until her own death nearly fifty years later in the castle of Tordesillas. In death Juana has found the devotion she never had in life and the devastation of her loss mingles with irrational relief that no other woman will ever compete for her husband’s affections again, that Philip of Habsburg is finally hers forever. . . . This scene, recorded by a chronicler who allegedly witnessed Juana’s very public descent into insanity following Philip’s demise, was immortalized by the romantic nineteenth century artist Francisco Pradilla, in a painting that is now one of the star attractions of El Prado. Haunting and executed with uncanny realism, it shows a woman in unrelieved black, standing motionless beside the coffin, as her exhausted retinue sags about her and tapers sputter in the wind. Nothing has cemented the image of Juana as the insane queen more eloquently than Pradilla’s painting, offering in vivid color the reason why she was deprived of her right to rule. But, is it true? Was Juana of Castile truly mad? Four hundred and fifty four years after her death, reams of nonfiction and fiction, as well as spools of vivid celluloid, have been devoted to this one aspect of her character, which, as with most legends, eclipses all other aspects of her complex personality. Scholars who believe she was unbalanced cite the taint of insanity that ran through her family. Isabel of Castile’s own mother Isabel of Portugal was so unbalanced that Isabel kept her in isolation at the castle of Arévalo until her death. This dowager queen, a dazzling Portuguese beauty when she first came to Spain to marry Isabel’s father, descended into an unimpeachable melancholy following her husband’s death and her banishment from court, reputed to float about the old castle at night talking to the specter of her husband’s male lover, whose execution she’d contrived at. Isabel never spoke of her mother’s illness, or at least not in a way that has come down to us, but the fact is the dowager queen never was seen at her daughter’s court. Isabel’s own father, Juan II, also nursed a penchant for brooding. Probably homosexual in an era that didn’t recognize sexual variance, tormented by his guilt over the man his wife had killed, he died broken and defeated. Indeed, Isabel’s House of Trastámara is riddled with odd characters, while Isabel herself once made a tantalizing reference to “[her] black malady” in a letter to an intimate, explaining that only her faith and devotion to Castile kept this mysterious malady at bay. Scholars who support the insanity verdict in Juana’s case suggest that what in fact Isabel fought against was a familial manic depression, which Juana had the misfortune to inherit. They even go as far to state that Juana herself showed early signs of the disease in her childhood, including marked moodiness, social withdrawal, and extreme temperament. It’s a compelling theory. Yet there is another, mostly unexplored side of the coin. Temperament aside, Juana was reputedly the brightest of Isabel’s children, gifted and keenly intelligent; and Isabel selected her as the center piece in the queen’s master-plan: the Hapsburg alliance, designed to bolster Spain’s power base in Europe and corner the French. This alliance, begun when Juana was still a child, culminated in her marriage at the age of fifteen to the Hapsburg emperor’s sole heir, Philip. Juana had supposedly by this time displayed all the alleged signs of instability mentioned earlier, and Isabel, with her previous experience with her mother, would no doubt have been aware of it. Yet the queen did not think twice about sending Juana to Flanders with secret political instructions, into a foreign court where Spanish interests depended heavily on Juana’s ability to influence her husband and lure him away from all attachments to France – even though Philip owed the French king his vassalage for his territories in Burgundy! It would have required a canny and perceptive wife indeed to steer her husband from such obligations, and Isabel clearly believed Juana was up to the task. Isabel was no fool. Why did she send a moody, potentially mentally unstable girl to fulfill a task that, if it failed, could have major repercussions for Spain? The proof is in the historical record. In the years that followed, Juana sought to fulfill her mother’s behest with single-minded determination; she also bore Philip six children and weathered as best she could the tumultuousness of life as his wife. She displayed remarkable physical resiliency and a healthy, if unorthodox, disdain for his hypocrisy; she never conceded defeat and challenged him to a duel for power that ended up felling him long before it did her. It’s not coincidental that Philip was the first to officially accuse her of being “mad” when she dared to confront him over his gross misbehavior. No prince liked having his wife upbraid him, especially when he depended on her if he was to wear a crown. And from this time onward, tales of Juana’s obsessive jealousy, uncontrollable rages, and disregard for anything save her passion for Philip fill contemporary accounts, as if some massive 16th century propaganda machine had gone into overdrive. Juana had done the unforgivable for a princess of her era: she had stood up for herself and thrown the gauntlet at her philandering, faithless spouse. Was she overly temperamental? Perhaps. But that does not make her insane. Aggravated by the near-unbearable stress she was subjected to in later years the fact is that Juana of Castile has been accused of mental instability because it excused the grave injustices perpetuated on her by those who sought to steal her throne.